i am a new user for SMS. i would like to know how to identify the in/out put boundary condition points? how to identify islands insid the water body? In general, you can use the display options to see where different boundary conditions are being applied. I use the mesh module. i attached a picture of my mesh indicating one of the islands. I would like to define the islands and the output/input flow to the water body. The required boundary conditions are MODEL specific. For example, ADCIRC requires the land and ocean boundaries to be defined with nodestrings. FESWMS requires you to only define the inflow and outflow boundaries with nodestrings. I work with hydrodynamic model called FVCOM which is not in the list. 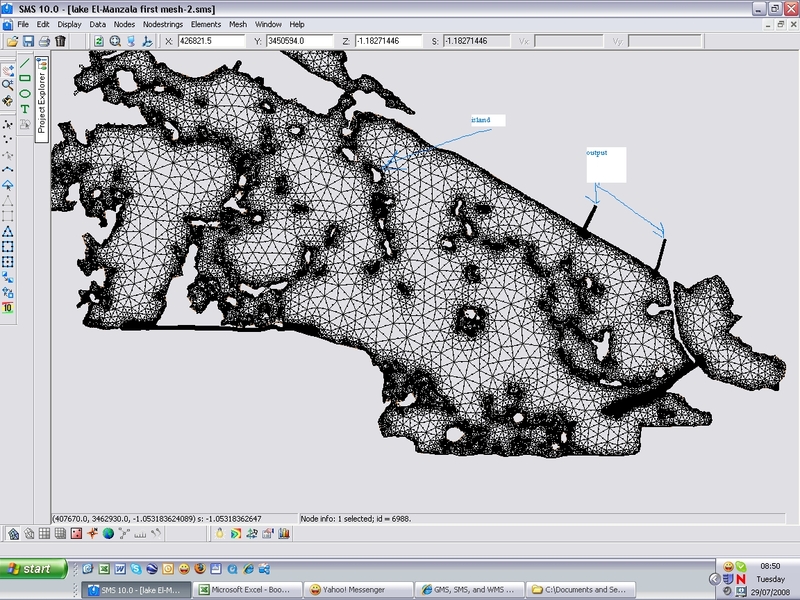 However in the FVCOM model manual SMS is the recommended software to construct the mesh. this information is appeard in Chapter 17 in the manual of FVCOM. The following link is for the FVCOM site. I have not heard of the FVCOM model until now, although Rusty Jones told me he met a user at the last training course he taught in the UK. I contacted the model developer and I believe boundary conditions are assigned outside of SMS for the FVCOM model. I would recommend posting your question on the FVCOM Forum.